Last week the Legion of Doom got their hands on the Spear of Destiny (thanks to Mick) to re-write their reality. We know things are different we Eobard Thawne does the show’s opening narration. We see how things are different for our Legends. In Star City, 2017 Sara and Amaya are the muscle for Mayor Damien Darhk. We open the episode with the two chasing after a female masked vigilante. When she is caught, we see that the two have caught Felicity Smoak. When brought to Darhk, he orders Sara to kill her, which she does by snapping her neck. Darhk then grabs Felicity’s mask and adds it to his collection, which includes the masks for Ragman, the Green Arrow, Wild Dog, Vigilante, the Black Canary, the Flash and Spartan. Meanwhile, Ray works as a janitor at STAR Labs, Martin works at STAR Labs and is being bullied by Jax into getting Thawne’s project up and running. Rip is back on the Waverider perfecting his baking skills and drinking away his sorrows. As a baker myself, I truly enjoyed “Doomworld” Rip. Gideon seems to be the only one that hasn’t been affected as she is working on repairing the Waverider and getting a signal out to our Legends. While the Legion has a reality in their making, everyone isn’t happy. Merlyn goes to see Thawne, who is now owner of STAR Labs and is celebrated for his scientific mind. Also, Thawne has trapped Black Flash. Merlyn wants the spear to improve his reality. Thawne refuses his request saying Merly has what he wants which is his wife alive, Tommy alive, Thea adoring him and Nyssa Al Ghul staying closeted and living in Ohio. Also, Thawne is the only person that knows how to use the spear considering he burned the book Malcolm retrieved. The last episode saw Mick betray the Legends by going back to Snart and giving the Legion the spear. Mick and Snart are back to their thieving ways but when the cops show up, they let the two go. Snart tells Mick that they are the kings of Central City. Mick seems bored that being able to get away with their crimes. The two are summoned to STAR Labs by Thawne, who orders them to keep an eye on Merlyn. Nate then barges in to STAR Labs with a horrible haircut. In this reality, Nate is a conspiracy theorist who has come to tell Thawne that they are living in a false reality. Thawne listens to Nate but then orders Mick and Snart to kill him. At a secluded location, Mick presses Snart on their plan as partner. Snart remains elusive and just as he is about to kill Nate, Mick knocks his partners out cold. Nate goes with Mick who explains his conspiracies are true. The two find Ray in his home playing video games based off his Atom suit. Ray doesn’t believe when Mick tells him he is a genius but we do see that show up in one of his inventions, which is a gun that can restore people’s memories. Mick grabs the gun and uses it on Nate. We see that Nate’s memories are restored and he punches Mick in the face for his betrayal. Nate then uses the gun on Ray, who also punches Mick. Unfortunately for the men, Sara and Amaya have been sent by Darhk to take care of them. Sara and Amaya tracked Mick down because of the GPS chip that Snart put in him. Unfortunately, Ray and Nate don’t have their super powers have do battle with the ladies. Amaya flees and Sara gets zapped by the gun. With Sara back to herself, she decides to back undercover to Darhk’s to retrieve Amaya. At the Mayor Darhk’s office it is clear the rest of Legion is tired having to take orders from Thawne and decide to work together to get the spear back. When Sara does return, we sense that Darhk knows something is up and taunts her about Laurel’s death. Sara takes the bait and tries to attack Darhk but he has his magic back and starts to choke Sara to death. Amaya is then ordered to kill Sara but she shoots her memory gun at her and Amaya is back. The Legends get Jax back too and he tells the team that Stein was building some sort of reactor for Thawne. The team realizes that Thawne wants to use the reactor to destroy the spear. The team plans on getting the spear back and using the incantation that Merlyn used to rewrite their reality. Mick is told to stay back as the Legends no longer trust him. 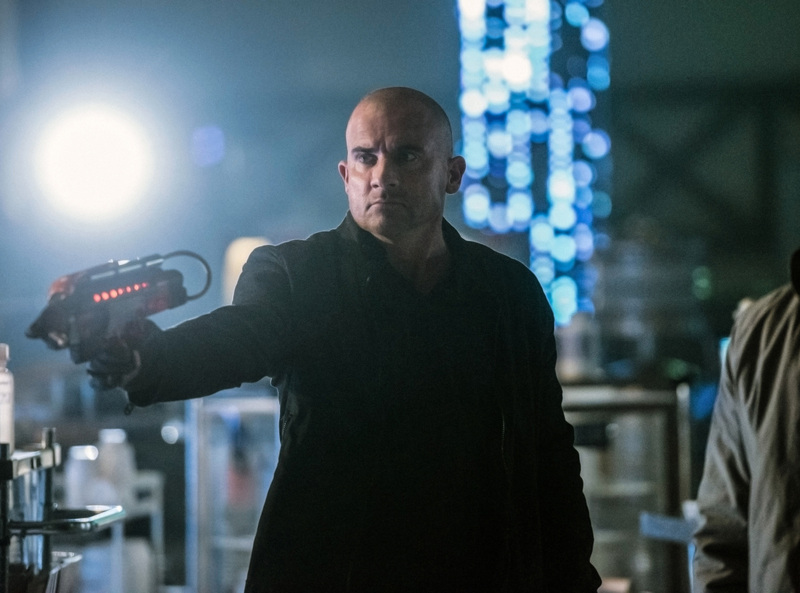 At an STAR Labs offshoot, Martin starts up the reactor and as it warms up, Jax tries to get Martin back but he just thinks he is being bullied again and fights back by knocking the memory gun out of his hand. Thawne in his Reverse-Flash costume arrives as do the Legends and Legion. It becomes a game of hot potato as the spear starts to change hands. At one point, Nate uses the spear to knock Thawne away like a basball. Darhk and Nate are about to high five each other before realizing they are enemies. Eventually, Mick gets the sphere and Snart asks for it. But Mick realizes that Snart is no longer the partner he thought he was and just thinks of him as a stupid dog. So Mick gives the spear to Amaya. Amaya starts to recite the incantation until Snart uses his cold gun on her, freezing her and then shatters her frozen body. The Legends are devastated at the death. This distraction allows Thawne to grab the spear and destroy it. Thawne relishes in his victory while the Legends and Legion are seething with rage. Everyone flees with the Legends going back to Nate’s mom’s basement. Sara knows what their plan has to be and that is to go back to 1916 and destroy the spear before the Legion gets it. Sara knows they are breaking one of their rules of time travel but feel they have no choice. Meanwhile, with Gideon’s help, Rip manages to get the Waverider up and running and is preparing to send a signal out. Unfortunately, the Waverider has been shrunk and looks more like a toy. I am hope that show did not kill off Amaya. I hope that the show keeps Amaya for the long run as I don’t think I would like a revolving door of female cast members. I am pretty sure if Amaya were truly dead that Maisie Richardson-Sellers would have been doing press about her departure from the show.